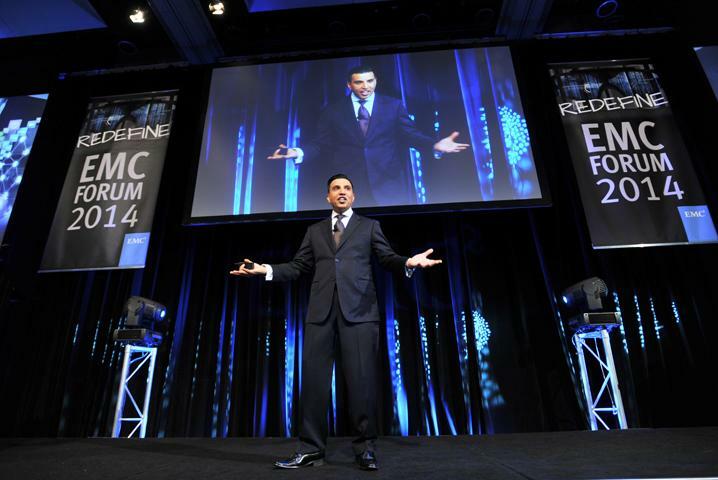 EMC vice president and managing director A/NZ, Alister Dias. The Sydney forum was held at the Hilton over several levels on August 1, while the August 6 Melbourne event was held at the Melbourne Convention Centre. The 28 partners included Ingram Micro, NextDC, Nextgen Group, Panduit, Rackspace, Schneider Electric, Splunk, Virtual, Instruments, Amcom, Cloud Solutions Group, Westcon, Cisco, CSC, Telstra, Accenture, Dimension Data, Thomas Duryea, VCE, VMware, Brocade, Infront, Intel, iQ3, Logicalis, Macquarie Telecom, CTERA, Data#3 and HILLS OPS. The forum included keynote speeches from Sunday Times sportswriter, David Walsh, EMC senior vice president and chief technology officer, John Roese and EMC vice president and managing director A/NZ, Alister Dias. EMC chief technology officer A/NZ, Matthew Zwolenski, told ARN the highlight was the demonstration of the Well-Run Hybrid Cloud. "It’s about helping a company build an internal private Cloud that connects to an external public Cloud," he said. "We demonstrated how companies can move workloads between both of those Clouds and then we demonstrated self service provisioning." Zwolenski said all-flash storage arrays, Big Data, next generation applications and the rise of Platform-as-a-Service were also some of the key takeaways from the event. "All-flash arrays are becoming mainstream and we have quickly become the market leader in that business," he said. "We are seeing workloads shift more applications to run on storage arrays that are 100 per cent flash." The forum followed the announcment of EMC's release of VMax3 enterprise storage, which new levels of agility, efficiency and control within the datacentre. He said there was a lot of discussion around how to build a Big Data architecture and the need for speedy app development. "How do you build a platform that can adapt to structured and unstructured data and how can you can build apps and update them regularly with Platform-as-a-Service" he said. "Platform-as-a-Service means organisations can build an app and get it out to the consumer more quickly. Zwolenski said the channel was vital to the success of the Well-Run Hybrid Cloud. "We need integrators to help us and we need partners to take our message to the market and then help the customers build the solution," he said. There's a big opportunity in the Well-Run Hybrid Cloud for partners to sell that methodology and service and in implementing the design fix." He adds EMC Forum was building every year. "It's now becoming the infrastructure event of year and hopefully we can built on that again next year," Zwolenski said.